Due to their hard nature, these trees derived their name from the Spanish phrase meaning "axe breaker". Logging activities have left many Quebracho species, including the pictured Schinopsis lorentzii, as threatened to various degrees. Due to their hard nature, these trees derived their name from the Spanish phrase, quebrar hacha meaning "axe breaker". Quebracho trees are evergreens that grow up to a height of 100 feet. It has a straight upward trunk covered with a broad scattering foliage. The Quebracho has a thick corky bark tinged with brown gray coloration. Its bark has deep furrows while its inner yellow gray smooth surface is mottled with black spots. The inner core is darker than the rest of the tree. Tannin is derived from its fibrous core. The timber of the Quebracho is one of the hardest in the world. The Quebracho tree has many commercial uses. Its timber is valuable due to its characteristically hard wood. The concentrated extract from its tannin was first thought to reduce methane emissions from cows that was thought to have a negative effect on the earth's atmosphere. In South America, its extract was used as a fever reducer. The extract and tree itself has no odor but has a bitter taste. Other medicinal and homeopathic uses are for alleviating asthma attacks and taken as a tonic, improves respiration and also gives relief for emphysema. Another species, the Quebracho Colorado, serves as a gastrointestinal stimulant. These medicinal uses were widely accepted in the early 1900s and not necessarily up-to-date. Quebracho trees grow widely dispersed in South America. The Quebracho species range from one end of South America to its other end. There are several species of the true Quebracho, as well as the lesser species of the tree. All species of this tree are found in Argentina, Brazil, Suriname, El Salvador, Honduras, Colombia, and Paraguay. The only other Quebracho species outside of South America can be found in Jamaica. It is known commercially as the tree with the hardest hardwood in the world. Its tannin extracts has many uses such as leather tanning, waterproofing shoes, eco-friendly paints, thermal insulation foams, and Safer glues for plywood. The Quebracho is known for its commercially important hardwood timber and tannin extracts. Three valuable species of the tree can be found in the forests of South America in the Gran Chaco region. These are the red quebracho (Schinopsis lorentzii), the willow-leaf red quebracho (Schinopsis balansae), and the white quebracho (Aspidosperma quebracho-blanco). A fourth less valuable Quebracho species is the loose quebracho (Jodina rhombifolia) which is sometimes closely linked to the three species. South America has many Quebracho tree species but most are of lesser timber and tannin quality. There are about 15 other Quebracho species that are also commercially harvested but are of inferior quality. The deforestation caused by Quebracho tree logging activities throughout South America started in the 19th century. Emilio Poisier, a French tanner first discovered that the Quebracho tree tannins were valuable in 1867. The Quebracho tannin was the primary source of vegetable tannin that its export to Europe became an important industry in Argentina. Ernesto Tornquist, another tanner soon established a logging concession in the Chaco region. Soon British companies moved in for the profit and business, creating extreme deforestation in the area. In a short period, this logging activities stripped the dry forests of the Quebracho trees. 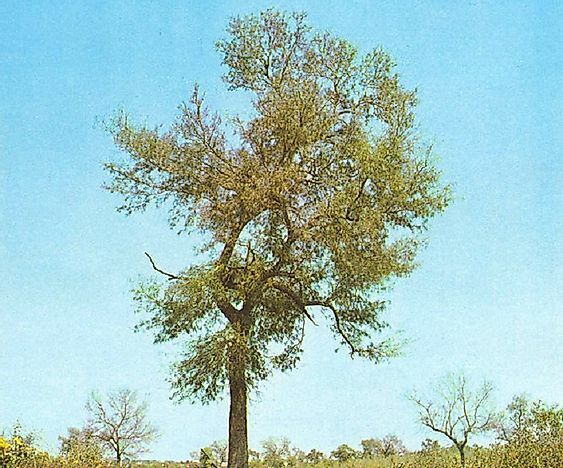 Although the Quebracho is Argentina's national tree, about 85% of Quebracho forests in Argentina is gone today. However, the 1998 International Union for the Conservation of Nature's (IUCN) Red List of Threatened Species lists the willow-leaf red quebracho (Schinopsis balansae) as of least concern due to its remaining common over large areas in Argentina, Paraguay, and Brazil.